WASHINGTON -- All five living former US presidents will participate in a benefit concert to raise money for hurricane relief efforts in Texas later this month, the George H.W. Bush Presidential Library Foundation announced Wednesday. Former Presidents Barack Obama, George W. Bush, Bill Clinton, George H.W. Bush and Jimmy Carter will appear at Reed Arena at Texas A&M University on October 21 for the "Deep From the Heart: The One America Appeal" concert. The event will also feature rock and country musicians including ALABAMA, the Gatlin Brothers, Lyle Lovett, Robert Earl Keen, Sam Moore, Yolanda Adams, Cassadee Pope and Stephanie Quayle. Country music artist Lee Greenwood will emcee the event. "The 43rd President and I, and our distinguished colleagues in this 'One America Appeal,' are very grateful to these wonderful performers -- some of them old friends, some of them new -- for giving their time and talent to help the urgent cause of hurricane recovery in Texas, Florida and the Caribbean," President George H.W. Bush said in a statement. "It's important that those affected by these devastating storms know that, even if the path to recovery feels like a road that goes on forever, we're with them for the long haul." This isn't the first time the former presidents have come together for "The One America Appeal." After Hurricane Harvey struck Texas in September, all five were inspired to join forces and filmed a video urging citizens to help out amid the devastating flooding. "We love you Texas," the elder Bush, who raised his family in Texas and previously served as a congressman from the state, said in a video posted to the One America Appeal site. 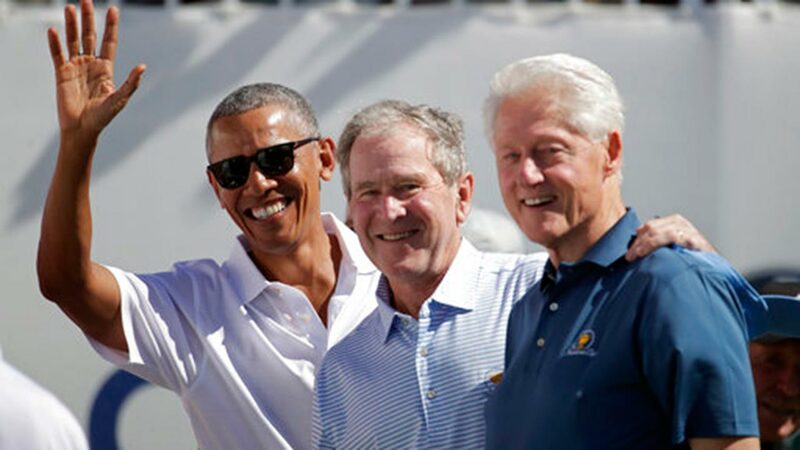 Three of the former presidents -- Obama, Clinton and Bush 43 -- were just together last week as they celebrated the opening ceremony of the Presidents Cup golf tournament in Jersey City, New Jersey. Funds collected through concert ticket sales will all be donated to victims of the storms and distributed from a number of charities. These organizations include the Houston Harvey Relief Fund, focusing on the greater Houston region; Rebuild Texas Fund, assisting hurricane-ravaged communities across the state; the Florida Disaster Fund; Juntos y Unidos Por Puerto Rico, launched by First Lady Beatriz Rossello and a private sector coalition; and The Fund for the Virgin Islands.